Susan went out to lunch with Roz on Thursday and I foraged here at home. I have been rather occupied with magic. I have been writing up a few effects to share with friends and I have been experimenting with some new ideas. In the evening I made my way to Jerito’s house and while we waited for the other to arrive, he filled me in on how and when our group was formed. He also shared with me the fact that the organization has a pin and I will be getting one on Monday. We did magic until 9:45 and then we went in search of dinner. We ended up at Los Malagueños again and it was as disappointing as my first visit. Most of the bar food, if not all of it, is pre-prepared and then warmed up when ordered. It either spends a few moments in the microwave or it is dumped into the fryer to warm up. The good news is that all of us were disappointed in the quality of the meal and I imagine that it will be removed from our list of places to eat. Yesterday we had lunch at La Fórcola again. We both started with a Mediterranean salad made with a variety of lettuces, cheese, black olives and several other ingredients. Susan had the pasta Gorgonzola as her main dish and I chose the pizza caprichosa. We opted for ice cream to finish our meal. La Fórcola’s ice cream is homemade and we chose their mascarpone and strawberry flavors. After our coffee we headed back home to read and rest up for our evening excursion. Brian and Ofelia came by at 8:30 and we headed out to La Rambleta to see a group called Plecs, a troupe that is based in Barcelona. This time we would be in the large auditorium instead of the café-teatro where we saw Karim a month or so ago. Once we settled into our seats I could not help but notice that the space between the rows was rather insufficient for anyone over six feet tall. My knees were an inch away from the back of the seat in front of me. My other complaint is that the lighting on the stairs that lead up to and down from the auditorium are poorly lit and, of course, I missed the last step on the way down and jammed my left foot and knee. However, I managed to survive the “oops” moment quite well. 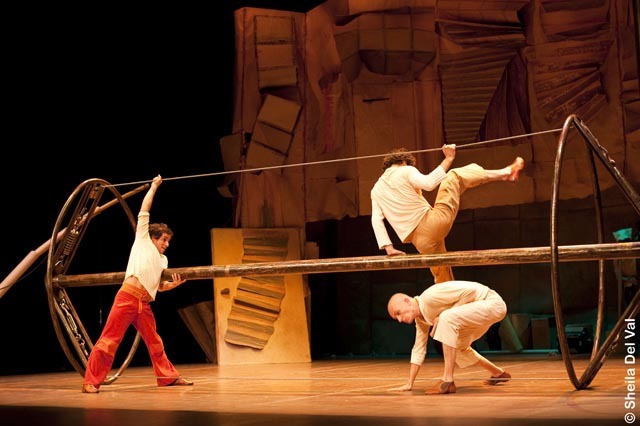 Plecs is a group of four young men and the show is billed as an exhibition of paper, music and acrobatics. All the sets and most of the props are made of paper or cardboard and for the ninety minutes that the performance lasts we get to see them do some astounding acrobatics and hear them play their instruments. There are moments when both skills are combined. The show is filled with comic moments and the show itself is very enjoyable. Here is a link to their promo video http://www.youtube.com/watch?v=Th8H2-FrJc0 . I thought the show could use some sort of a running narrative to unify the various pieces that were presented, but, still and all, it was an enjoyable experience. After the performance we headed back to Brian and Ofelia’s neighborhood in search of a place to have a late night bite. It was Friday night and it was a little after 10:30 and all the terraces were filled with diners. We ended up at the terrace of a small bar and it was not one of our better dining experiences. The bottle of wine we ordered was too warm and that should have been a tip off. We ordered a variety of tapas and my bet is they were all frozen and were of the same quality one would find at the supermarket. The only positive thing that I could say was that the edge was taken off our appetite. Brian drove us home and when we walked through our front door it was 1:00 AM. We read for a while to let our meal digest and we turned off the lights at 1:30.